Last week we explored Sixteen Mile Creek on the west side looking for evidence of the old tunnel through the Hog’s Back. We found an old stone structure that looked like a tunnel entrance that had been filled in. Owing to the fact that it wasn’t in the location we expected, we determined that it was not the tunnel we sought. Having circumnavigated the hog’s back we had determined that the openings on either side had been closed off, either intentionally for safety or through a mud or talus slide. This week we returned to have a look on the east side of the creek for the remains of the old dam. The post card below is over 100 years old and shows Sixteen Mile Creek with the dam intact on the left of the photo. The earth and stone berm can be seen running out toward the creek where the water spills over the dam. The creek flows around the hog’s back and then under the railway bridge. The wood stave flume passes under the railway bridge on its way toward the mill. William Chisholm purchased 960 acres of land at the mouth of Sixteen Mile Creek in 1827 with the plan to create ship building yards there. Another of William’s early ventures was the construction of saw and grist mills both of which were completed by 1833. The grist mill was located downstream from the Hog’s Back but the mill pond was on the opposite side of this geological feature. The solution was to bring the water through the hog’s back in a tunnel. St. Mary’s Pioneer Cemetery contains the city’s earliest founders including William Chisholm. There are a few parking places on Lyons Lane near the entrance to the cemetery. Just inside the gate there is an opening in the fence and a small path. It is possible to descend to the creek level but caution is required as the footing is loose. The large “S” that Sixteen Mile Creek forms as it rounds the hog’s back makes directions a little odd when you reach the creek. You are on the east side of the creek but west of it. You’ll walk south toward Lake Ontario as you make your way upstream toward the old dam. The dam can be seen in the picture below as the white line running horizontal through the trees in the middle of the photo. Looking back along the dam you can see where it met the embankment with St. Mary’s Pioneer Cemetery at the top of the hill. The dam stands eight to ten feet off of the creek floodplain. A cross section of the dam can be seen by walking out to the end and climbing down the side. Large pieces of dolostone were layered to form a sturdy wall. A layer of soil was scooped up off the floodplain to deepen the mill pond and provide a covering for the dam. A wooden crib filled with stone was used to span the creek. The dam was built in the winter when water levels were low and maintenance was also done during these months. The dam has been removed from the creek to help prevent flooding and reduce the danger downstream should it eventually fail. Tracing the line of the old dam to the creek’s edge you can see the stone in the water and on the far embankment that marked the dam’s east end at the hog’s back. The dam met the hog’s back at the extreme left in this photo. The now closed entrance to the water tunnel would have been along the embankment in this picture, perhaps near the large tree with the platform in it. Following the dam back to where it meets the ravine side you will find a small path that leads back up to the cemetery. The picture below shows how obvious the dam is when seen from above, once you know that it is there. Keep your eyes open as you walk through places where there is a lot of limestone because it can often be found with fossils in it. The piece pictured below has fossil worms and twigs and what appears to be a moth near the middle. 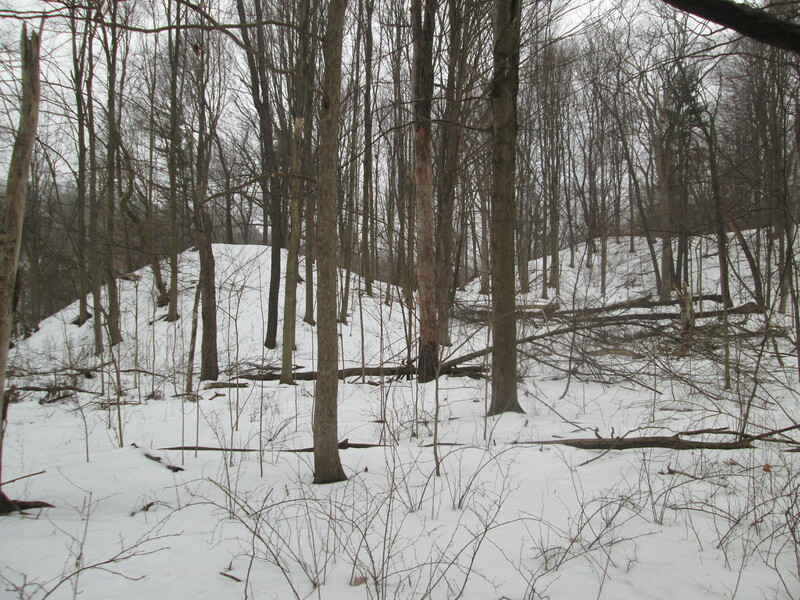 The woods near Sixteen Mile Creek were alive with robins. Groups of birds are not always called flocks and a group of robins is known as a “round”. In England, they are also known as a breast and in the USA they are called a wave. Perhaps this is where the term “round-robin” comes from. The round of robins by the creek was fat and obviously well fed. It is most likely that these birds have returned from their migration south, perhaps pushed north by storms below them. Two robins stop for a drink from the creek in the picture below. Our fifteen all-time most popular hikes are featured in this special presentation. 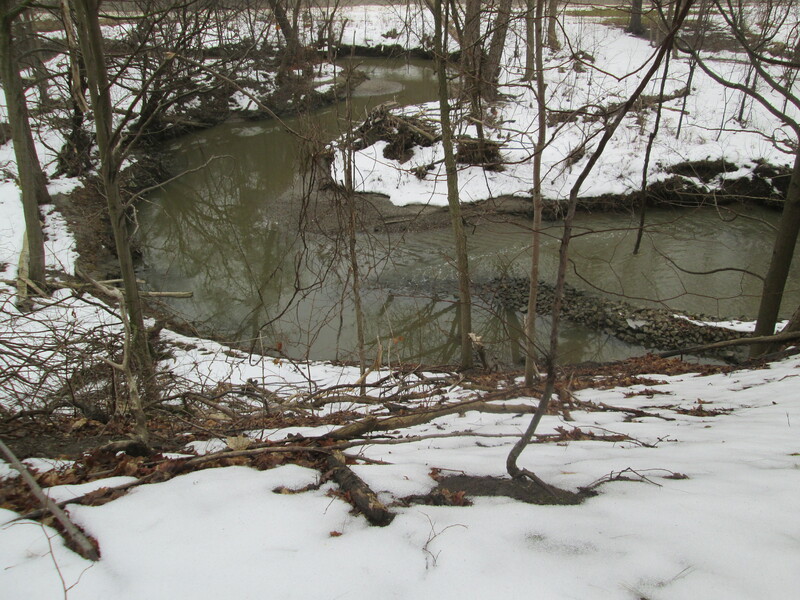 This entry was posted in Sixteen Mile Creek and tagged fossils, Robins, Sixteen Mile Creek, St. Mary's Pioneer Cemetery on February 4, 2017 by hikingthegta. It was a couple of degrees above freezing when we parked in the Downsview Dells parking lot south of Sheppard. With one week left before the official start of spring, there are finally some signs that it is coming. Bartholomew Bull bought a farm on lot 8 concession 3 (west of Keele between Lawrence and Wilson) in 1830 and gave it to his 2 year old son, John Perkins Bull. When John got married in 1844 he settled on the farm and named it Downs View. He opened his house up as a place for religious services and during the 35 years he spent as Justice of the Peace he held court in his house and locked the convicts up in the cellar. The house is currently in use as North Park Nursing Home. Hopefully they don’t lock up the patients in the old jail. When this park was created in 1960 it was named Black Creek Park. The name was soon changed to prevent confusion with Black Creek Pioneer Village. Black Creek flows from its headwaters in Vaughan to where it empties into the Humber River in the middle of Lambton Golf and Country Club. 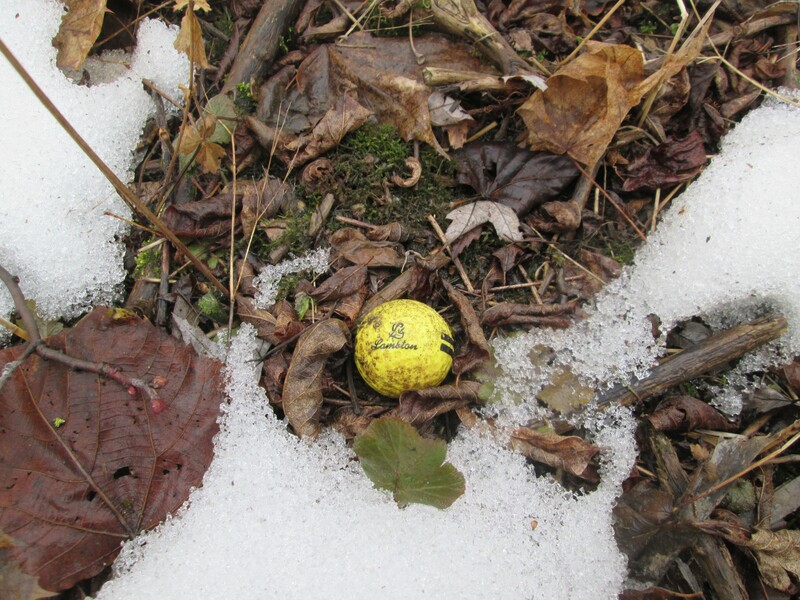 Golf balls are a frequent sight along Toronto’s parks and ravines. A golf ball will have between 300 and 500 dimples on it, with the number 366 being used frequently. Early in the history of golf, players noticed that older balls with nicks and bruises on them went further. These marks create turbulence in the layer of air closest to the ball and increase the distance the ball travels. The dimples on the ball are there to act as turbulators. We found a Lambton golf ball that wouldn’t be out of place a few kilometers south of here. As we headed south down the west side of the creek we found ourselves climbing in and out of little valleys and hills. A dell is a small treed valley. When the name was changed from Black Creek Park to Downsview Dells it was certainly appropriate. The cover photo shows the entrance to the park in 1963. One of the first sure signs of a change in the weather is the revival of those creatures that hibernate. Not all spiders hibernate. Many of them produce an egg sac and then die in the fall. 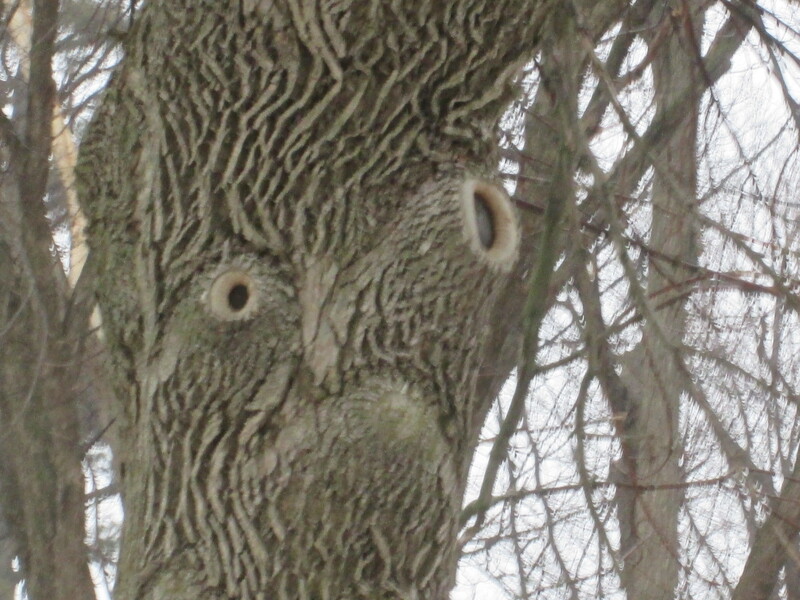 Others build a nest inside the bark of a tree or in a rock pile. At one point we found a split in a rock and dozens of tight little spiders nests inside. When the weather warms up in the spring they hatch or wake up. We saw this little spider hanging from a sumac tree. Later we saw another spider of a different variety. It was very tiny and perhaps a new hatchling. 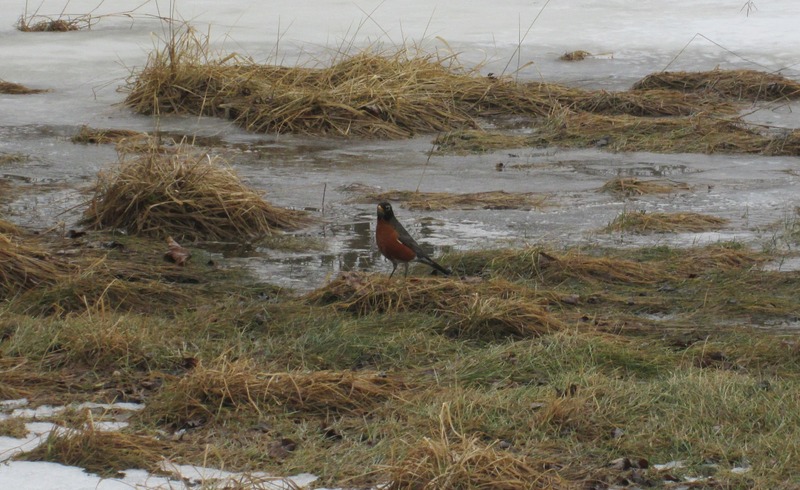 The American Robin migrates south and returns along with the warmer weather. We saw a large flock of them making their way along the muddy ground listening for worms. 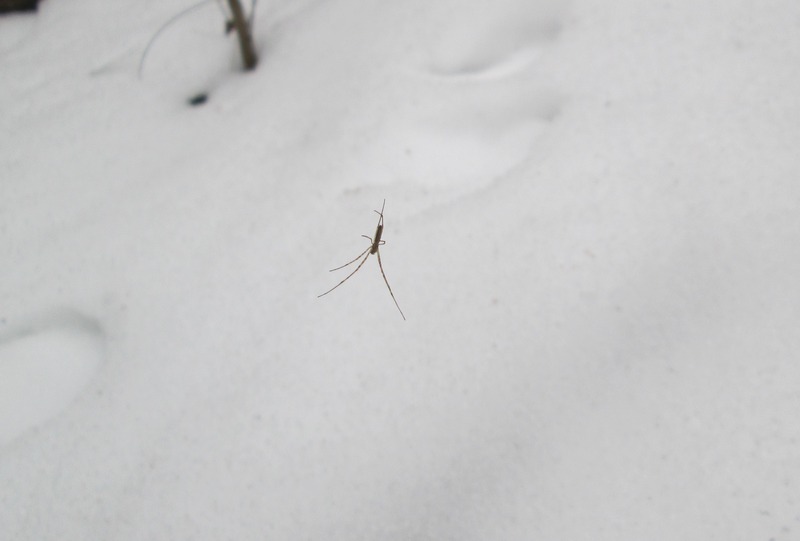 With the ground still frozen below the surface the worms are not yet accessible but at least the spiders are. A further sign of spring is the open water on the creeks and rivers in the city. Two weeks ago we were able to cross at will. The water has not crested yet and it will continue to rise until the snow is melted and the ground thaws out. With the slow melt this year we may avoid some of the more serious flooding that a quick melt can cause. 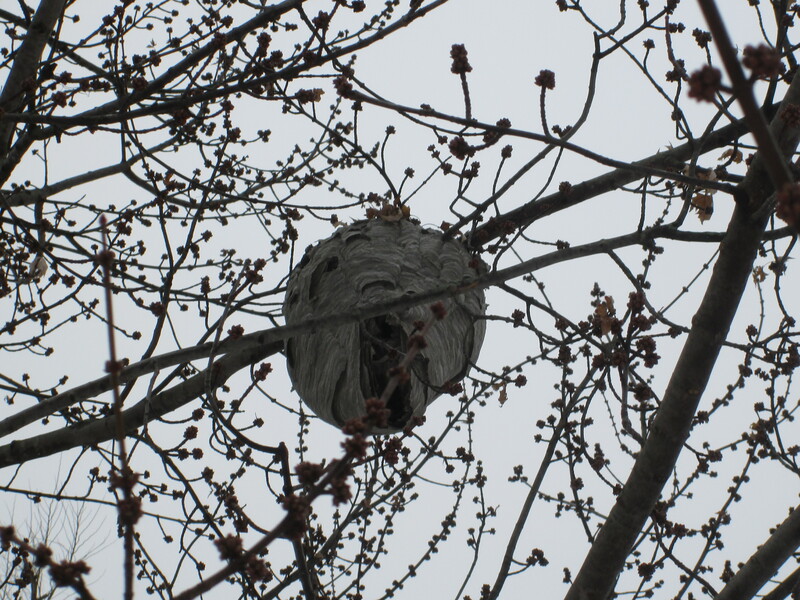 This giant paper wasp nest is about the size of a soccer ball. Notice the buds on the tree which are starting to open. In the 1930’s the Great Depression resulted in many homeless men drifting through Toronto looking for work. 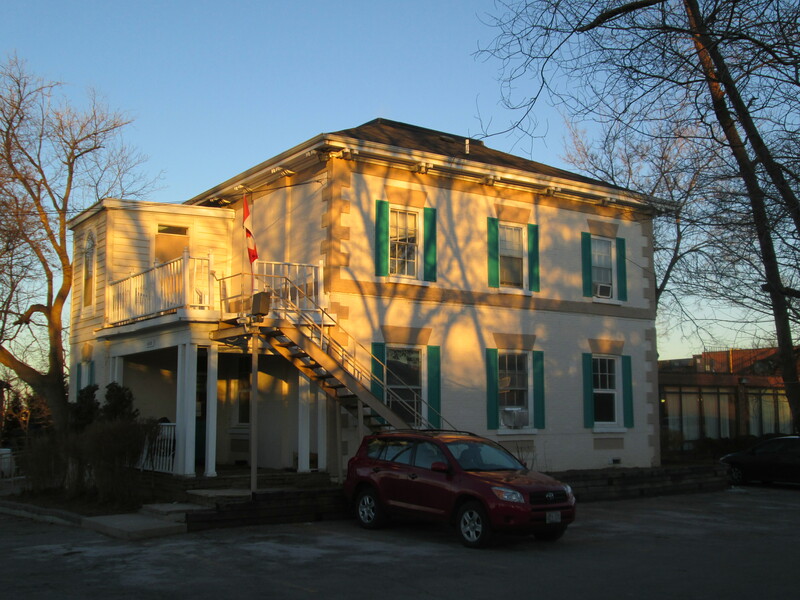 The original Seaton House was built in 1931 to provide food and shelter for some of these men. In it’s current facilities since 1959, it has housed up to 900 men at a time, making it the largest homeless shelter in the city. Seaton House also operates Downsview Dells. This drug and alcohol rehab centre is tucked within the northern end of the park. It houses 30 men who are referred there from Seaton House. 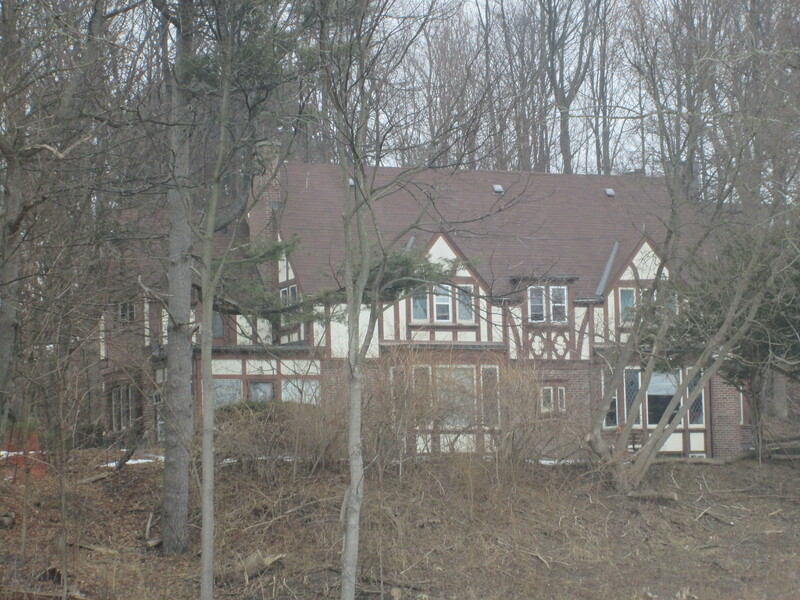 The house has a no trespassing sign on the side but is clearly visible from the park. Perhaps the high success rate is due to the Ent who stands guard near the drive way to the rehab centre. This entry was posted in Black Creek and tagged Downsview Dells, Robins, Spider on March 19, 2015 by hikingthegta.